They found that, for a cubic meter of pure water, the amount of time it will take for a nucleus to form is about one-millionth of a second. The study, conducted by Amir Haji-Akbari, a postdoctoral research associate, and Pablo Debenedetti, a professor of chemical and biological engineering, was published online this week in the journal Proceedings of the National Academy of Sciences. 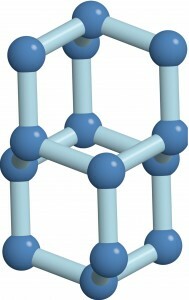 Cubic ice is made of double-diamond cages, each of which contains 14 water molecules arranged into seven interconnected six-member rings. Hexagonal ice is made of hexagonal cages, each of which contains 12 water molecules arranged into two six-membered rings that sit on top of each other. Using a computer model to explore how water molecules connect and nucleate into ice crystals, the researchers found that two types of ice compete for dominance during nucleation: cubic ice (blue) which is less stable, and hexagonal ice (red), which is stable and forms the majority of ice on Earth. Nucleation occurs when water molecules come together to form blobs (pictured above), which grow over time (left to right). Eventually hexagonal ice wins out (not shown). The researchers found that adding new cubic features onto an existing crystalline blob gives rise to nuclei that are more spherical, and hence more stable. 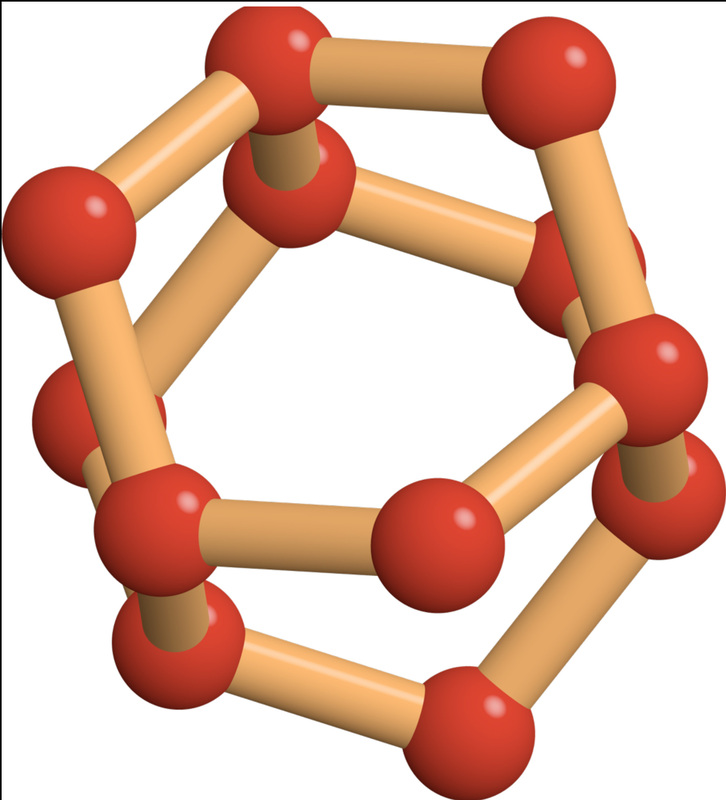 In contrast, adding hexagonal features tends to give rise to chains of hexagonal cages that make the nucleus less spherical, and hence less stable. Read the abstract: Haji-Akbari, Amir and Pablo G. Debenedetti. 2015. Direct calculation of ice homogenous nucleation rate for a molecular model of water. Proceedings of the National Academy of Sciences Early Edition. Published online August 3, 2015. Images courtesy of Amir Haji-Akbari, Princeton University.